17 February - DAT recorders... came across a Sony TCD-D8 and a Panasonic SV 255. 28 February - while surfing the web, I discovered that a Chinese American composer won 2 Grammy's earlier this month. Christopher Tin won an award for 'Best Classical Crossover Album' (Calling All Dawns) and 'Best Instrumental Arrangement Accompanying Vocalists' (Baba Yetu). 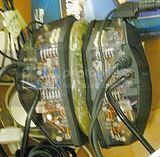 The latter was included in the album, but it's better known as the theme song for the Sid Meier computer game, Civilization IV. 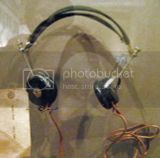 Next to it, I've placed a picture of headphones used 40+ years earlier (during the Nuremburg trials), just to show the changes in design and technology. 7 April - Jen Shyu (based in NY), Baltimore, MD... She did solo stuff, accompanying her vocals with Moon Lute, erhu, and piano. Then she did an improv duet with Dave Ballou on trumpet, where they moved about on stage. She sang/vocalized and her movements seemed to incorporate tai chi and some sort of sewing/harvesting task.. (pics to come)... I renewed my acquaintance with her (having met her briefly 8 or 9 years ago in San Francisco) and she said she got a Fulbright to study gamelan singing in Indonesia. 18-21 May - Asian American studies conference, New Orleans. 14 June - since it's Che Guevara's birthday, today, here's a picture of a recording of him issued by the Smithsonian Folkways label. I saw this last year, at the Smithsonian's annual Folklife Festival on The Mall in DC. 16 June - saw jazz / improv pianist Craig Taborn give a solo recital in Baltimore at An die Musik. The house was packed! That surprised me. I didn't realize that his abilities had impressed folks in previous ensemble appearances and word had gotten around. I'd seen him a bunch of years ago (probably with a group led by percussionist Susie Ibarra), and had noted his pianistic prowess. So the recital was terrific. I'd arrived a bit tired, but left energized by what I saw and heard.